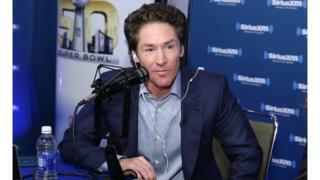 Image example Joel Osteen na Pastor of Lakewood Church, wey im papa open since di 1950s. Pastor of one of di biggest church for America don reverse word wey im talk, begin allow people wey no get anywhere to stay because of tropical storm Hurricane Harvey dey inside im church. Joel Osteen announce for Twitter say im dey receive victims of di tropical storm, wey don flood almost everywhere for Houston, Texas sotay e enter another state wey be Louisiana. People bin dey vex say Lakewood Church say dem no open their hall to flood victims. Dem enter social media dey wonder say how church no go dey there for those wey need help. Dis na after di church office talk for social media on Monday say for safety reason, nobody go fit enter di church because of plenty-plenty water wey full everywhere. But after people all over di world drag di matter, na so di church do about turn, change mouth. Mr Osteen respond quick-quick, add im wife sef inside di matter: "Victoria and me care well-well about di people of Houston. Lakewood door dey open and we dey here for anybody wey need where to stay." Im wife Victoria na im be Co-pastor for Lakewood. Nine people don die because of Hurricane Harvey, wey be di biggest storm wey don nack Texas since up to 50 years.